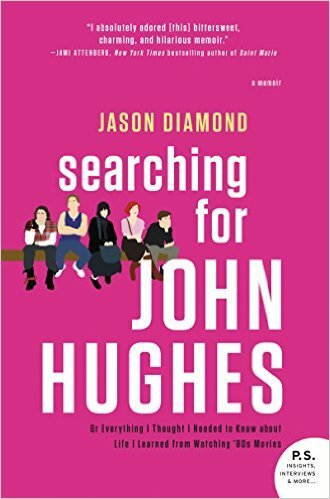 Summary (from the back of the book): From the outrageous, raunchy antics in National Lampoon's Vacation to the teenage angst in The Breakfast Club and Pretty in Pink to the insanely clever and unforgettable Home Alone, Jason Diamond has long been infatuated with John Hughes' movies. And so the seed was planted in his mind that he should write a biography of his favorite filmmaker. It didn't matter that he had no qualifications, training, background, platform, or direction. Thus went the years-long, delusional, earnest, and assiduous quest to reach his goal. But no book came out of these years. What he did get was a story that fills the pages of this unconventional, hilarious memoir. In Searching for John Hughes, Jason tells how a Jewish kid from a broken home in a Chicago suburb found comfort and connection in the likewise broken lives in the suburban Chicago of John Hughes' oeuvre. He moved to New York to become a writer. He started to write a book he had no business writing. All the while, he watched John Hughes movies religiously. 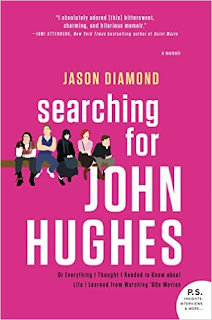 Though his original biography of Hughes has long since been abandoned, Jason has discovered he is a writer through and through. And the adversity of going for broke has now been transformed into a really, really good story. A memoir of growing up, this is a tale of what comes after the "Go for it!" part of the command to young creatives to pursue their dreams--no matter how absurd they might seem at first. Review: I can't imagine anyone my age who doesn't have fond memories of John Hughes movies. His list of films is amazing, right? So how could I not read this book?! However, the book took me far too long to read and I am not sure if that's because I liked it, but didn't love it, or if I just had a week where my reading was slow. I like the idea of the author driving around Chicago and its suburbs literally and figuratively searching for John Hughes. And the John Hughes movies sprinkled throughout the book are fun since I loved those movies. But really, this book is about a boy who had a difficult upbringing, is abandoned by his parents and becomes an angst-ridden man in his twenties trying to find his way. That story is important as well. How do we define ourselves? What matters and is worth pursuing? What are we willing to drop in order to move on with our lives? Tracking down John Hughes is what defines the author's life for more than five years; I think it's the thing that kept him going and gave him purpose. When John Hughes died so did the goal, which made him rethink his life and what he was doing. It opened him up to a positive existence rather than one in which he was simply moving from one activity to another.